Creation: Appeared in July 1933 as a renumbering of VA 502 as the only VA 165. Initially, it ran from VA 27 (now VA 168 Bus) Great Bridge east to Princess Anne CH, then northwest to US 460 (now VA 165Y) near Thomas Corner. Adjustments: In Aug 1933 (CTB), VA 165 was extended northeast with US 460, then cut north as new routing on Diamond Springs Rd to end at US 60. About 1938, VA 165 north was truncated back to its original endpoint at US 460 (now VA 165Y). Diamond Springs Rd became VA 13 (now VA 166). In March 1942 (CTB), VA 165 was extended north along the new Military Hwy to Little Creek Rd, then west along Little Creek (was SR 600) to end at VA 170 (now US 460) Granby St. In Nov 1943 (CTB), VA 165 was extended north along the new Military Hwy (replacing VA 13Y to Little Creek Rd, then left Little Creek Rd at Admiral Taussig Blvd and followed that as new primary routing northwest to Norfolk Naval Base to replace VA 337 on 98th St, then across the ferry to Newport News to Jefferson Ave to end at 25th St, US 60. Little Creek Rd west to Granby became part of an extended VA 351. In June 1944 (based on an item in the Jan 1945 CTB), VA 165 was rerouted to stay on Little Creek Rd all the way to Hampton Blvd VA 337, replacing part of VA 351. 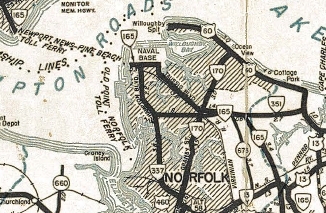 The route to Norfolk Naval Base and across the ferry to Newport News became part of VA 168. Today this is I-564, VA 337, no ferry anymore, and unnumbered Jefferson Ave in Newport News. 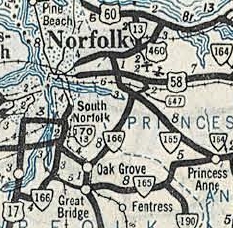 About 1958, VA 165 was rerouted to hit Northampton Blvd a little east of Military Hwy as it does now, leaving behind Old Kempsville Rd. 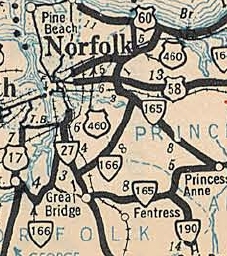 In Nov 1962 (CTB), VA 165 was extended west from Great Bridge over SR 640 to end at VA 166 (now US 17). In Aug 1965 (CTB), VA 165 was extended west again along Cedar Rd, replacing VA 166 to end at US 17 Deep Creek. In Feb 1982 (CTB), VA 165 was removed from Parliament Rd in Kempsville between VA 403 and VA 190 and put on its current routing. About 2007, VA 165 was put on newly built construction between Deep Creek and US 17, leaving behind most of the decidedly non-straight Old Cedar Rd alignment VA 165 had been using. The earliest confirmed multilaning of VA 165 was in place by 1947, on Little Creek Rd between Taussig Blvd and Military Hwy. In 1956, VA 165 was multilaned on its Military Hwy routing. 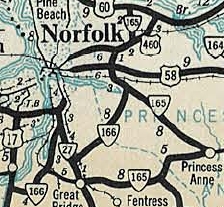 The 1957 Official erroneously shows VA 165 widened from US 58 to US 13 (still 2 lane today). 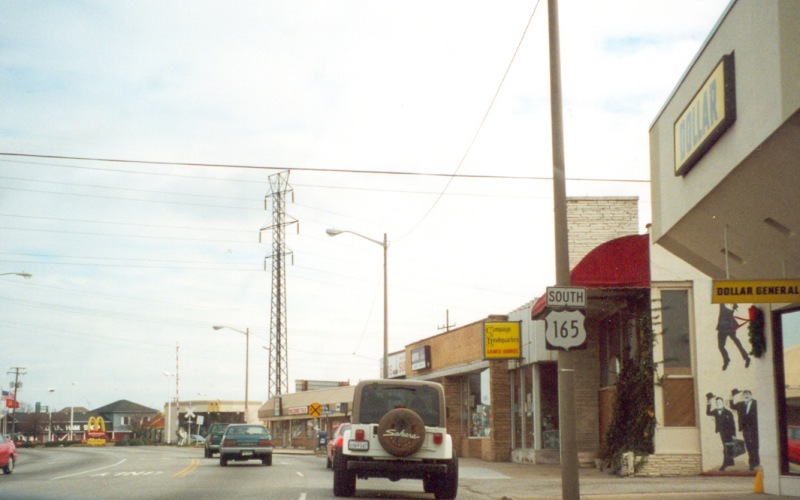 In 1960 or 1961, VA 165 was multilaned from Taussig west to Hampton Blvd. In 1973, VA 165 was widened from just west of VA 190 to 1.5 miles east of VA 190. In 1975, VA 165 was widened from Newtown Rd to VA 190. In 1982, VA 165 was widened from US 58 to Newtown Rd. 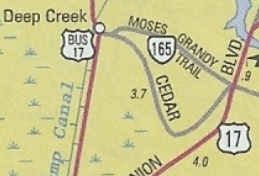 When VA 165 was moved onto the new Moses Grandy Trail near Deep Creek in 2007, that was multilaned. By 2007 (GMSV) VA 165 was multilaned from US 17 east to Albemarle Dr, which is near Great Bridge. This didn't show on official maps until the 2012 issue. About 2014, VA 165 was multilaned between Dam Neck Rd and Nimmo Pkwy. VA 165 is 8 lanes from Ferrel Pkwy to Dam Neck Rd. Posted: Fully posted; last known cutout removed from jct with Centerville Tpk in 1992 or so. An error US 165 shield existed SB approaching US 13/VA 166 from at least 2006-16 (last GMSV). Another US 165 shield existed EB leaving US 460 Wards Corner in 2001 (gone by 2012 GMSV). Yet another US 165 shield existed SB at VA 247 briefly in the 2012 timeframe. Comment: VA 165 is not a route anyone would drive from end-to-end in order to reach someplace. Between Great Bridge and Princess Anne CH the route is still relatively rural and wide open. VA 165 is blown off by I-64 between I-264 and US 13.